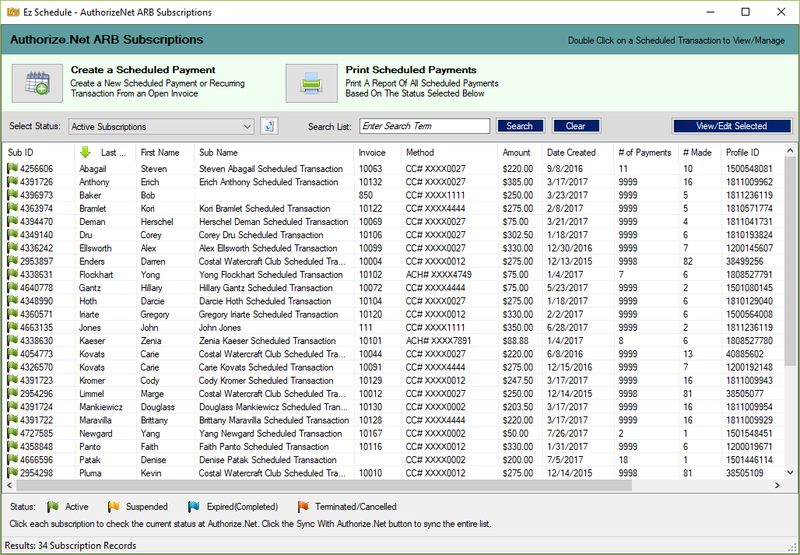 QB EzPay used in conjunction with Authorize.Net™ ARB® (Automated Recurring Billing) system provides multiple methods for creating subscriptions. 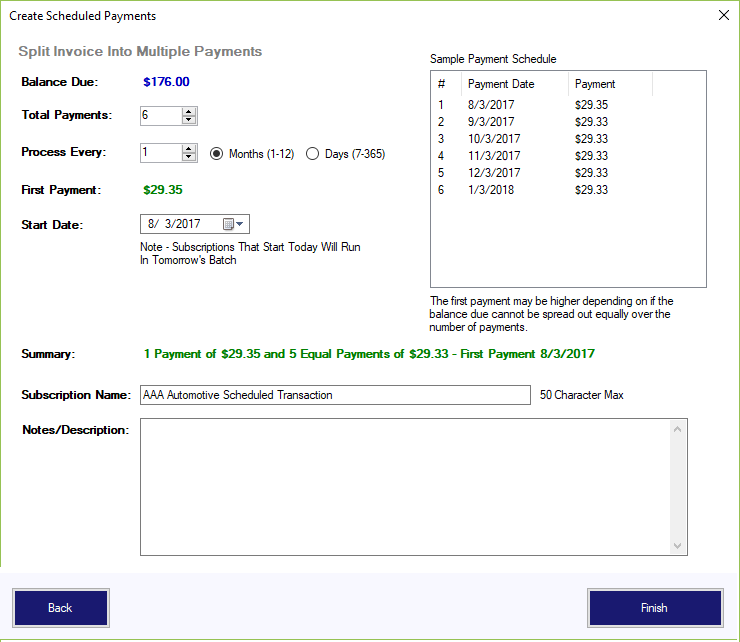 Simply select an existing invoice and create a subscription that includes the customer’s payment information, a billing amount, and payment schedule. Once the scheduled paymets are created ARB® does the rest, generating subsequent transactions based on the schedule provided. As these future payments are received they can be imported directly from the batch or transaction reports in QB EzPay and posted to that specific invoice in QuickBooks™. 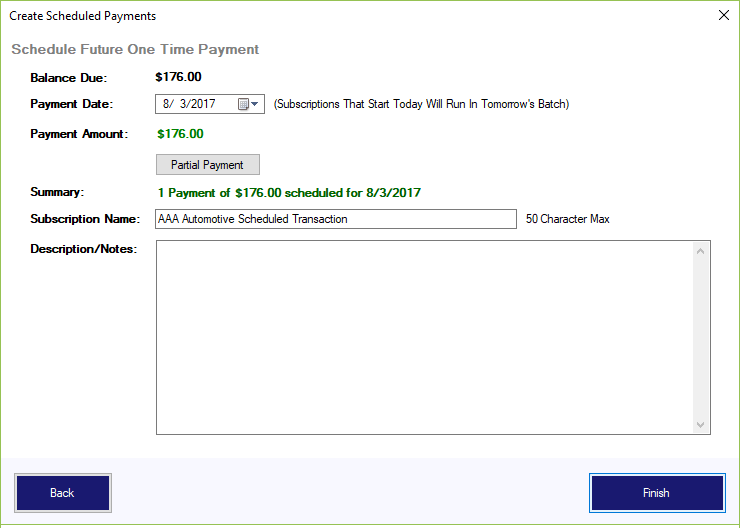 Tracking and managing your ARB© subscriptions are easy using the EzSchedule tool within the QB EzPay application. At a glance you can see the current statuses of all your current running subscriptions allowing you to identify any needed changes or updates. Expired payment methods can be easily updated to new ones and subscriptions can be edited or cancelled as needed. Generating a new subscription from an existing invoice is simple. Click the payment method you would like to use for the recurring or scheduled bill and the New Subscription Wizard takes over. The wizard allows you to schedule a future one time payment for a partial amount or the entire balance of the invoice, split the entire balance into a payment schedule you specify, or create a recurring charge for invoice balance for the number of times you select. This wizard option allows you to schedule a one time payment for any amount up to the entire balance of the selected invoice. This feature is useful for your customers that need to be charged in the future but are giving you their payment information today. The payment will be automatically billed to the Credit Card or Bank account entered without the need for you to remember to charge the customer or having to store their payment information. When scheduled the payment will be posted dated in QuickBooks™ to show the invoice as paid. 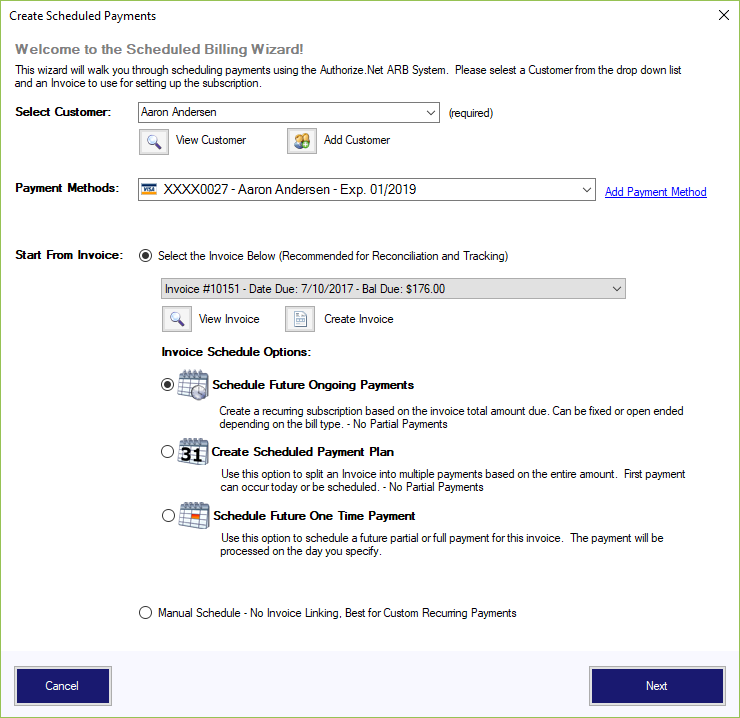 The scheduled payment can the be managed in EzSchedule and the Authorize.Net™ ARB© system will email you the status of the transaction once it is processed. Payment plans in QB EzPay for a selected invoice is simple because we do the math for you. The invoice can be split evenly over the number of payments or a different first payment amount can be entered. You can specify whether to charge monthly or daily and what the interval will be between payments. Simply change the options as you see fit and watch the projected payment list amounts dynamically change depending on your selections. Processing fees can be automatically charged for scheduled payments as well as whether the first payment should be charged today or in the future. Have customers you regularly charge for goods and services? 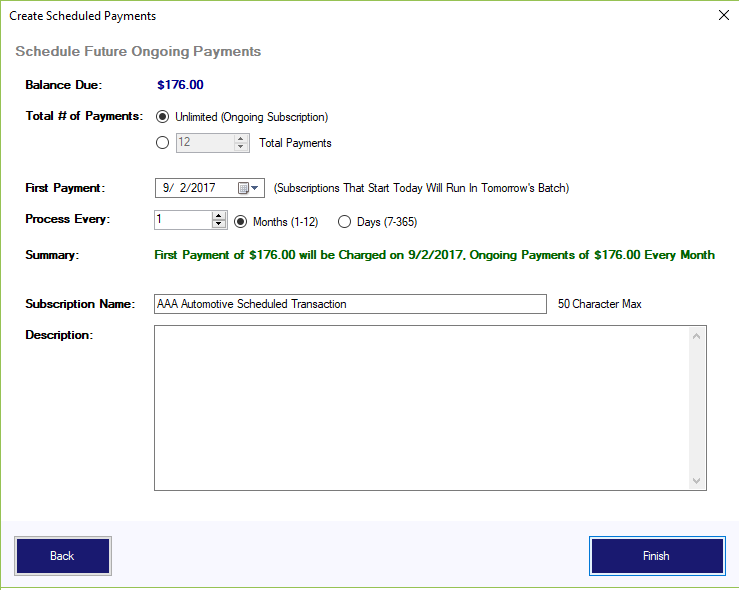 By selecting the schedule ongoing payment option you can charge for an invoice indefinitely or for a specific time frame. These payments can occur monthly or daily depending on the interval you specify between payments. This feature is useful for subscription based services like repeat services, magazines, memberships, etc.